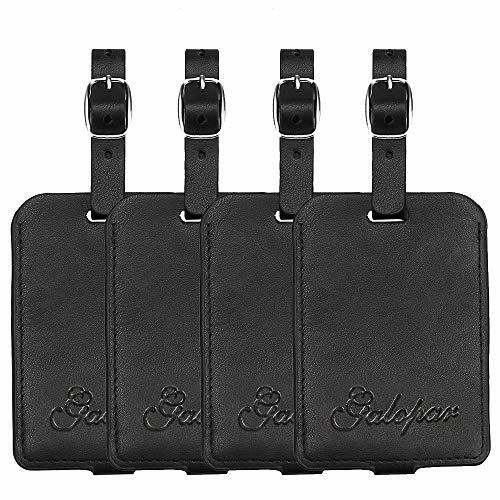 Galopar Luggage Tag made of hight quality PU leather, soft, lightweight durable and convenient. Unlike other luggage labels, Galopar luggage tag comes with a cardboard and there is enough space to wirte your information. What's important, the tag has a leather flap which will cover personal information, travelers don't need to worry about their information being read by others. With the convenient snap fastener on the flap, travelers can read their information without removing the strap. Choosing Galopr luggage tags, providing convenience to your travel and you will have a good trip. Information Security---Galopar PU Leather luggage tag comes with a cardboard, you can write your personal information, such as name, address and so on. You don't need to worry about your information being read by others, as the flap will cover it. Moisture Proof--- After opening the flap, there is a PVC surface above the cardboard to make your card be waterproof. Easy to identify---With the stylish luggage tag, you can find your stuff quickly on the convey belt at the airport. You can save more time to enjoy your trip.